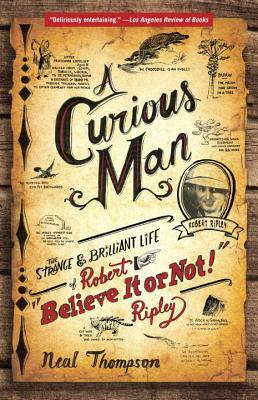 A Curious Man is the marvelously compelling biography of Robert “Believe It or Not” Ripley, the enigmatic cartoonist turned globetrotting millionaire who won international fame by celebrating the world's strangest oddities, and whose outrageous showmanship taught us to believe in the unbelievable. As portrayed by acclaimed biographer Neal Thompson, Ripley’s life is the stuff of a classic American fairy tale. Buck-toothed and cursed by shyness, Ripley turned his sense of being an outsider into an appreciation for the strangeness of the world. After selling his first cartoon to Time magazine at age eighteen, more cartooning triumphs followed, but it was his “Believe It or Not” conceit and the wildly popular radio shows it birthed that would make him one of the most successful entertainment figures of his time and spur him to search the globe’s farthest corners for bizarre facts, exotic human curiosities, and shocking phenomena. Ripley delighted in making outrageous declarations that somehow always turned out to be true—such as that Charles Lindbergh was only the sixty-seventh man to fly across the Atlantic or that “The Star Spangled Banner” was not the national anthem. Assisted by an exotic harem of female admirers and by ex-banker Norbert Pearlroth, a devoted researcher who spoke eleven languages, Ripley simultaneously embodied the spirit of Peter Pan, the fearlessness of Marco Polo and the marketing savvy of P. T. Barnum. In a very real sense, Ripley sought to remake the world’s aesthetic. He demanded respect for those who were labeled “eccentrics” or “freaks”—whether it be E. L. Blystone, who wrote 1,615 alphabet letters on a grain of rice, or the man who could swallow his own nose. By the 1930s Ripley possessed a vast fortune, a private yacht, and a twenty-eight room mansion stocked with such “oddities” as shrunken heads and medieval torture devices, and his pioneering firsts in print, radio, and television were tapping into something deep in the American consciousness—a taste for the titillating and exotic, and a fascination with the fastest, biggest, dumbest and most weird. Today, that legacy continues and can be seen in reality TV, YouTube, America’s Funniest Home Videos, Jackass, MythBusters and a host of other pop-culture phenomena. In the end Robert L. Ripley changed everything. The supreme irony of his life, which was dedicated to exalting the strange and unusual, is that he may have been the most amazing oddity of all. NEAL THOMPSON is the critically acclaimed author of Light This Candle, Driving with the Devil, and Hurricane Season and has contributed to such publications as Outside, Esquire, and Sports Illustrated. He lives in Seattle with his wife and two sons. You can find him at www.nealthompson.com. "Ripley's amazing American life itself plays out like an impossible fairy tale." "A Curious Man is the rollicking, terrific story of one of America’s greatest men…Ripley brought back to an awed nation the richness of an endlessly exotic world, and Neal Thompson tells the story with a perfectly-pitched sense of what makes such a man, and a nation, tick." "Ralph Waldo Emerson once said that the history of a time can be resolved in the biography of a few stout and earnest people. Robert Ripley was certainly one of those and, in this fascinating account, Neal Thompson rescues for us a colorful slice of history." "Anyone who wants to understand America needs to read this book…Neal Thompson gives us a vivid portrait of this complex, restless man in all his maniacally conflicted glory." "Intelligent and gripping…Neal Thompson expertly captures the surprisingly complex character of Robert Ripley, and a life nearly too fantastic to be believed." "A Curious Man is a work of real beauty and fun and emotion -- and intense readability. It is a single-session book, one of those that takes your clock and renders it mute until the book has had its say. Thompson is the genuine article: smart and witty, empathetic and a pleasure to read." “For the first time anywhere, Neal Thompson brings us Ripley in all his gaudy glory, crafting a hardboiled Horatio Alger story for a media-obsessed age." "A biography of a man who was as unusual as the items he collected…An outstanding work…I couldn't pull myself away." "Believe it! Neal Thompson has written the definitive biography of the larger-than-life Robert L. Ripley, the father of our minutiae-mad modern society."